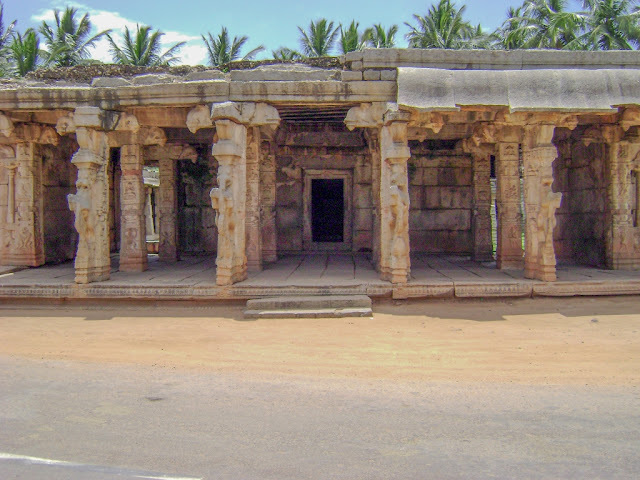 Chandikeswara temple in Hampi is a 16th century construction which is dedicated to Lord Vishnu. It is currently abandoned and in complete ruins. However the finely carved Matapa in front of the temple with “Yali” pillars is of particular interest. “Yali”, is a fierce mythical creature which has a leonine face, protruding eyes and fangs. As we enter into the Chandikeswara temple, we see an empty sanctum however near to the sanctum we can see a crudely built chamber in which there is an idol of Goddess Kali. This is a rare temple in Hampi which has the Kali as the deity. The idol is having two hands, in which she holds a rice ball and a ladle. This form of Goddess Kaali is particularly striking as Kaali is most often depicted as a warrior goddess with fierce weapons in her hands. As we exit the Chandikeswara temple, we can see the Uddana Veerabhadra Temple stands right opposite to it. 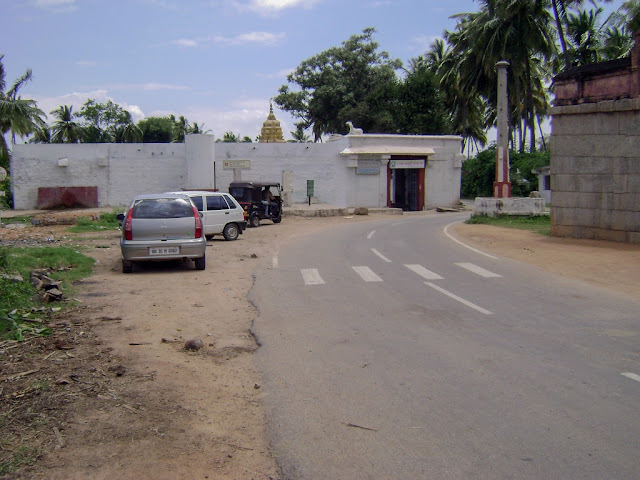 the Uddana Veerabhadra temple is dedicated to the fierce God Veerabhadra. In front of the Veerabhadra temple, there is an inscribed stone slab which attributes the construction of the Chandikeswara temple and the Uddana Veerabhadra temple to a General in the Vijayanagara army. The construction date of the Uddina Veerabhadra temple in Hampi is believed to be 1545, hence it can be assumed that it was just before the Vijayanagara Empire was conquered and Hampi was vandalized by the Mughal invaders. There is also a Sati stone at the entrance of the temple. Sati stones are usually erected in honor of the wives who committed suicide on the funeral pyre of her husband. Sati is banned in India in 19th century itself, however it was a cruel and barbaric ritual. There is a legend connecting the God Veerabhadra, Goddess Kali and Sati devi. It goes like this: , Sati was the first wife of Lord Shiva, before Parvathi. Sati was the daughter of Daksha. When Sati was attracted to Lord Shiva and wanted to marry him, Daksha was not so keen about the alliance. He did not want his beautiful daughter getting married to a nomad who wears the raw leather and covered in funeral ash.” Against Daksha’s wishes, Sati and Lord Shiva got married. Daksha did not give Shiva the due respect and avoided inviting him to any occasions in his palace. During such a celebration, Daksha humiliated Shiva in front of the guests. Unable to tolerate the disgrace, Sati committed suicide by jumping into the sacrificial fire at the celebration. Shiva was furious with anger and grief. He ripped off his hair in frustration. Veerabhadra and Goddess Kali were born from where the hair touched the ground. Sati – later become one of the dark rituals of India –where the wife commits suicide by jumping into the funeral pyre of her husband- might have origins from this story. As we enter the temple, we can see the tall idol of Veerabhadra in the inner sanctum. There are still poojas conducted for the deity. The fierce appearing God has 4.6 meters high and can be seen as holding a bow,arrow, sword and shield in his hands. 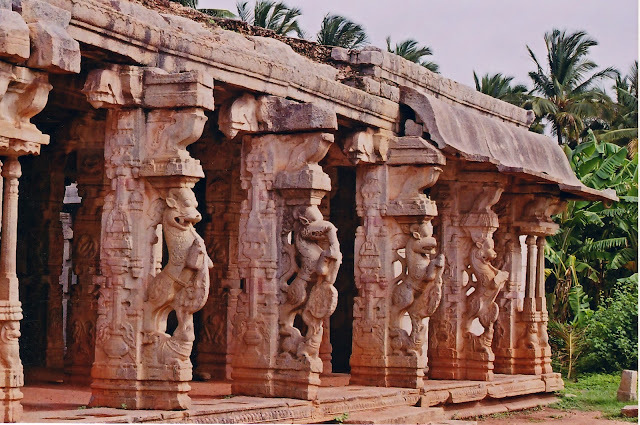 Uddina Veerabhadra temple is also a special temple in Hampi with the rare form of Shiva. The exteriors of the Uddina Veerabhadra temple seems to be of post-Vijayanagara period. Originally the sanctum housing the Uddina Veerabhadra was contained inside an open Matapa, in front of which a main road was passing. However, later the Mantapa was covered to form the temple in the present shape. However it is not clear when this modification was done.